to sell signed copies of my books. Remember – books are a great choice when it comes to choosing a gift for a keen reader among your family and friends. Novels can make an excellent gift as long as you know the taste of your gift recipient. And if not, or you’re unsure, why not surprise them with a story they might not have considered reading before? A member of the audience at one of my recent author talks told me that I had inspired her to read outside her comfort zone. The next few weeks are very busy and I have one author talk and five Christmas Craft Fairs lined up already, with the prospect of more to come. So if any of these are near where you live do drop in for a chat at my bookstall. along with my non-fiction book Perilous Path: A Writer’s Journey, and also copies of the new anthology Merry Christmas Everyone to which I’ve contributed a piece. On Wednesday 7th November at 7.30pm I’ll be giving my Author Talk “The Power of Story” at the Northgate Methodist Church, Warwick. On Wednesday 28th November I’ll be selling signed copies of my books at the Christmas Shopping, Pamper, Psychic and Holistic Night at Stonebridge Golf Course from 7 to 10pm. Post code: CV7 7PL. On Sunday 2nd December find me at the Christmas Market at the Graham Adams Centre in Southam.Set your satnav for CV47 OLY. On Saturday 8th December, drop in to the Christmas Market in King Edward the Sixth School, Stratford-upon-Avon – postcode CV37 6BE – and have a chat at my stall. Or on Saturday 15th December 2-4pm you’ll find me at the Christmas Fair at the Park View Care Home in Warwick CV34 4ND. Hope to see some of you at one of the Warwickshire Christmas Fairs! Approaching Coughton Court, the ancestral seat of the Throckmortons, near Alcester in Warwickshire, we may admire the mellow sandstone sixteenth century house with its dramatic battlemented gatehouse tower and lovely timbered north and south wings. In front is the most exquisitely laid-out garden packed with abundant lavenders. Everything about this house and its surrounding grounds and gardens speaks graciousness, fine proportions, serenity: all that tends to make us feel relaxed, good-humoured and full of positive anticipation. But that has by no means always been the case. In the past this house has known betrayal, terror and conspiracy. This house has been held by the Throckmorton family for over 600 years and during that time the vast majority of them have been fervent Catholics, remaining loyal throughout times of great persecution. Several generations of the Throckmortons have been closely involved with some of the major events of English history. The first Throckmortons to own land in Coughton were John and Eleanor in 1412 and John became the founder of this historically-important family. A later Throckmorton, Robert, was knighted in 1494 along with Prince Henry, the future Henry VIII, thus beginning the family’s long association with the Tudor monarchy, sometimes profitable, always dangerous, and ultimately fateful. His son George was to discover the folly of opposing Henry VIII in his attempt to divorce Katherine of Aragon; the mortification of being a dissenting guest at Anne Boleyn’s coronation; the inadvisability of thwarting Thomas Cromwell in a land dispute; and, no doubt, a rather uncharitable sense of vindication at finding himself prosecution witness at Thomas’s trial and in a position to seal his fate. Robert’s son Nicholas stands out among the Throckmortons as having been a Protestant; and I cannot help wondering how that affected his family relationships, coming as he did from an otherwise unbroken line of devout Catholics. Nicholas too discovered the slipperiness of close involvement with the Tudor monarchy. He had a very narrow escape when his support of Lady Jane Grey ended in defeat; found himself in prison after opposing Queen Mary’s marriage to Philip of Spain; and suffered the thanklessness of Elizabeth after he had acted as confidant to the young princess, brought the news of Mary’s death to her, and finally acted as her emissary to Mary Queen of Scots. All of this failed to win for him the high office at court which he had hoped for. After Nicholas’s death, the family resumed its activities on behalf of the Catholic side with renewed zeal. In 1584 his nephew Francis was executed for trying to depose Elizabeth and place Mary Queen of Scots on the throne. In 1858 a 16th century priest-hole was rediscovered in the Tower Room: a double hide, one chamber on top of the other, so the priest hiding in the chamber below would have been highly unlikely to be discovered, even if the upper chamber came to light. The Tower room is where the family kept a small altar with everything needful to celebrate Mass according to their Catholic faith; the windows both sides of the room gave extensive views out onto the surrounding countryside so they would be alerted to anyone approaching the house from a considerable distance away. Certainly they would have had plenty of warning if Elizabeth I’s priest-hunters were approaching, and enough time to hide the priest together with all the objects of Catholic worship in that ingenious hiding place. When you begin your tour of the house, you are soon shown through a well-laid-out exhibition about the Gunpowder Plot; and after visiting that, as you enter the drawing room on the first floor of the Gatehouse, you cannot but be very aware that this was the room where the first news of the plot’s failure was broken to those who waited here. In the early hours of 6th November 1605, Lady Digby, the wife of Sir Everard Digby, one of the Plotters, sat in this drawing room, anxiously awaiting news. At 6am Thomas Bates, servant to Robert Catesby (charismatic mastermind of the plot) galloped across the bridge over the moat and climbed the stairs to the drawing room. No doubt drenched with sweat, wild haired and eyes full of terror, Thomas broke the news which would have filled her with horror and fear: the plot had been discovered, Guy Fawkes arrested, her husband Sir Everard captured, and his fellow conspirators were all on the run in fear of their lives. She would have had no doubt whatsoever about what lay in store for her husband and his friends. The fate that awaited all those found guilty of treason was a vile and brutal punishment: hanging, drawing and quartering. It was, however, a fate that many chose to risk. They were desperate times. The stakes were high, and hot-headed, religious zealots were willing to run that risk for their passionate beliefs. Following this, the party at Coughton Court quickly dispersed to various locations, among them two priests, Nicholas Owen the master priest-hole builder, and the Vaux sisters who had rented Baddesley Clinton for the express purpose of providing a safe meeting place for priests, together with concealed chambers they could hide in during raids. Meanwhile, the plotters fled to the house of another Catholic friend, hoping for support, which they did not receive: instead they headed off to Holbeach Hall, where final disaster awaited them. Of those who fled to Holbeach Hall, we learn in the special exhibition at Coughton Court, four suffered the least painful, and the quickest, death. They (incredibly) betrayed their presence by trying to dry their gunpowder in front of the fire. Not surprisingly (but presumably, it surprised them) their gunpowder exploded. The noise alerted the Sheriff of Worcestershire who came with his troops and surrounded the house. In the ensuing gunfight the next morning, four conspirators were shot dead, including Robert Catesby the charismatic mastermind of the plot. Of the others, six were tried on 27th January 1606 and executed at the end of that month. One other, Francis Tresham, was arrested on 12th November and fortuitously died of a natural illness in the Tower on 23rd December. The room in which Lady Digby received Thomas Bates’ news is a beautiful one to our eyes, and we might expect to find a lingering atmosphere of fear and dread. But indeed no such feeling hangs around this room, and our emotional response to the story may be most clearly elicited in the room which holds the exhibition. The information about the Plot is imaginatively displayed, thus giving visitors their best chance to remember the names of the people involved and the details of their desperate flight and foolhardy actions during those final fateful hours after Guy Fawkes was discovered in the cellars beneath the Houses of Parliament. Whatever we may think now of the issues at stake during years of turmoil in which England swung back and forth between Catholicism and Protestantism, nevertheless, when viewed on the human scale, we see individuals chancing their lives and family destinies, on the hoped-for success of desperate strategies, utterly at the mercy of the State’s ruthless response to their own religious zeal, often leading to heart-rending and grisly outcomes. Here at Coughton Court, home of the Throckmortons who were so closely connected to those dramatic events, we may see this played out through generations of unswerving Catholic devotion both before the events of 1605 and for centuries after, right down to the present day. After Sir Robert Throckmorton became Lord of Coughton in 1680, he built an illegal Catholic chapel, only to see it burned down by a Protestant mob, during the anti-catholic riots which were followed by the exile of James II. The mob also burned the east side of the house, and the ruins stayed there for another century. When I enter a house such as Coughton Court, the rich surroundings, the elegant and lofty rooms, the grand family portraits and the harmonious decor play their part; but most powerful of all is the story of the house, brought alive by the artefacts that are displayed here. We may find the chemise that Mary Queen of Scots wore on the day of her execution; the dole-gate that one of the family, Elisabeth Throckmorton, Abbess of Denny, brought with her as a poignant memento as she fled the dissolution of the monasteries; the chair made out of wood originally used for the bed Richard III slept on before he fought the Battle of Bosworth. And, too, we may view the family photographs of the present-day members of the Throckmorton family – two of them, Clare McLaren-Throckmorton and her daughter Christina, responsible for the design and creation of the enchanting walled garden. These photos also have a poignancy to them, when you remember the contemporary family’s forbears. We may consider this a luxury few may claim, to know your family history back 600 years; but I believe there may be a certain burden in carrying this, a certain weight on your shoulders, a weight of knowledge of the details of your ancestors’ vices and virtues, their hopes and failures, their deeds, their triumphs and disasters. It’s said that an image is much more powerful than words; which is rather a shame for authors who write books that don’t have any pictures! And so an author’s alternative is to paint a picture with words. Because, as author Isamu Noguchi says, We are a landscape of all we have seen. In my new non-fiction book Spirit of Warwickshire I have chosen several places in Shakespeare’s county which I believe have spiritual presence; and each chapter is accompanied by a full colour photo of the highest quality, showing some of the spirit of each place. Many of the places are associated with Shakespeare, and each chapter is headed with a quote from the Bard of Stratford-upon-Avon, which I feel corresponds either in spirit or in specifics to what I feel about the place I describe. And so might I meditate on the meaning of that at my first sight of the Burton Dasset beacon, which appears on the hill as you drive along the B4100 from Warwick to Banbury. A new visitor driving towards the Burton Dasset Hills Country Park from either Warwick or Banbury might have little idea of the view which will greet them from around the next bend in the road. Without warning, an extensive radiant visa rises into view, seen beyond the green hills of this former quarry, now a place which many sheep call home and to which a large number of visitors are attracted each year wiith their dogs and families, to walk, to picnic, and to admire the views from the highest point, crowned by a beacon. Just such a beacon appeared to William Shakespeare as he wondered how he would encapsulate a beacon to the wise. Now I’ve begun work on my new book Spirit of Warwickshire, here’s a taster of what you’ll find in it. The book, which I plan to release later this year with Luminarie, will contain a selection of articles about places in Warwickshire which I’ve visited and which have spiritual resonance. These will be places which carry meaning, places which have power, and places which set off chains of reflections, memories, dreams. Each of my articles will be accompanied by a full colour original photo of the location by my photographer daughter Abigail Robinson. There will be lots of beautiful craft items and quirky Christmas gifts for you to browse, plus plenty of delicious refreshments. I’ll be selling my books at a special discount: £8 for one book, £14 if you buy both together. And for people who like books signed by the author, you’ll have that benefit as well! And remember, books make an ideal Christmas gift. It would be lovely to see some of you there! On Sunday 1st May 2016 I’ll be selling signed copies of Mystical Circles and A Passionate Spirit at the Stratford-upon-Avon Craft and Gift Fair. The Fair starts at 10am and finishes at 4pm. I’d love to see you there if you’re free on that day, and in Warwickshire! In addition to my book stall, there will be plenty of crafts and gifts for you to browse through and buy. It’s being held in Stratford Town Hall, 1 Sheep Street, Stratford-upon-Avon, Warwickshire CV37 6EF. If you’re not a regular visitor to Stratford-upon-Avon why not take the opportunity to come along to the craft fair in the morning, then visit some of the lovely Shakespeare properties later on? I hope to see you there on May Day! Hidden in the heart of rural Warwickshire is a Saxon Sanctuary I only recently discovered. It’s in St Peter’s Church at Wootton Wawen, situated between Henley-in-Arden and Stratford-upon-Avon. In the Lady Chapel, an exhibition tells the story of Wagen’s woodland village in the Forest of Arden. 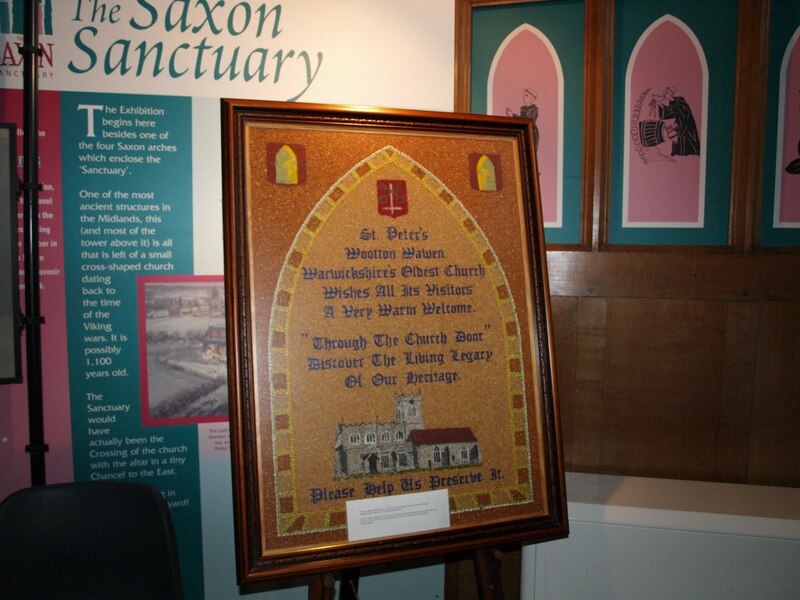 Wagen was a Saxon lord who owned the land (the “manor”) of Wootton before 1066. And I thought of him as I looked through the exhibition. When William the Conquerer took over, he swiped that land from Wagen and gave it, (as was the way of many English monarchs) to a pal of his. In this case the lucky recipient was Robert of Tosny, Earl of Stafford. History doesn’t record what happened to Wagen. As I wandered around the church, I mused upon the lessons of history, and whether I can learn anything from them, in my life. Along with the Saxon Sanctuary, three other streams of thought played into my musings – a recent TV programme on the 50 greatest treasures found by members of the public; a BBC TV drama production of Shakespeare’s “Henry V”; and our planned visit to Bosworth to see the re-enactment of the Battle of Bosworth where Richard III was killed, thus signalling the end for the Plantaganets and the rise of the Tudors. A Viking with “bad attitude” buried his plunder meaning to come back later and collect it – but he never did. It lay in the earth until it was found by chance 1300 years later. Henry V triumphed at Agincourt, then married Catherine daughter of the King of France. Their son Henry VI was a bit of a wash-out as a king, and would have preferred not to be king at all; he shrank from the role whereas his father had been famed for his valour. Following Henry V’s death when his son was 9 months old, Catherine went off and married Owen Tudor and thus started the Tudor dynasty. When Richard III fought Henry Tudor at Bosworth, Henry was the rank outsider, and Richard would have been expecting to win. Shakespeare has him saying, “A horse! A horse! my kingdom for a horse!” He probably never said it but with those words Shakespeare exactly captures not only the poignancy and significance of that moment, but gives us a metaphor for human life many can recognise. Mary I believed she’d restored Catholicism to England. She meant to secure a Catholic future – but whatever she achieved was only temporary. Her pregnancy turned out to be a phantom one, she died, and the throne passed into the hands of her protestant half-sister. So I meditated on the fickle changes of fortune, and how they interface with our lives. – Richard III’s (metaphorical) horse had been available at the moment he needed him? – Mary I had had a successful pregnancy which led to the birth of a healthy baby, thus securing a Catholic Tudor dynasty in England? – if Harold had beat William at the Battle of Hastings in 1066? – if James II had won the Battle of the Boyne? – if Charlotte, the beautiful daughter of George IV and Caroline of Brunswick, (as beloved as Princess Diana was when she died in 1997) had safely given birth to a healthy child, and lived to claim the throne and reign for 60 years, before Victoria was ever thought of? – if Edward VIII had not met Mrs Simpson? Some of these events could be interpreted as arising from errors of judgement and human failings; others from quirky twists of fate. Many potentially great or significant people have been swallowed up by fate and removed from the arena of the world; and thus prevented from affecting the destiny of the human race. Shakespeare was well aware of that. So what do I deduce from this? And is this something that can apply to anyone who has a dream or vision or sets out upon a course of action with a great goal in mind – such as a creative writer who would like their words to be read by many? Simply that success or failure is not determined by hard work and striving. Certainly “hard work and striving” cannot just be dispensed with. But perhaps we have to live with a healthy knowledge that that they may in a moment be swept away, and rendered irrelevant, by a quirky twist of fate. What do you think? Do you share my fatalism? Or are you a historian who disagrees with my interpretation of English history? Do consider leaving a comment! Imagine the Warwickshire countryside in silence and darkness. A rabbit running from the headlights. Imagine a radiant moon and bright stars. The fresh rich smell of silage in the night. A tiny ancient church on a hill, lit only by candles within. Imagine rocks, water, Celtic prayers and songs – and you’ll know what I was doing last night. Within the church with its rough stone walls are tall candlesticks and centuries-old choir stalls and pews. And a small group of people with torches. We were there with our leader, Annie Heppenstall , to commemorate the life of St Non, Celtic saint – the mother of St David, patron saint of Wales. St David’s Day is 1st March, and St Non’s Day is 3rd March. 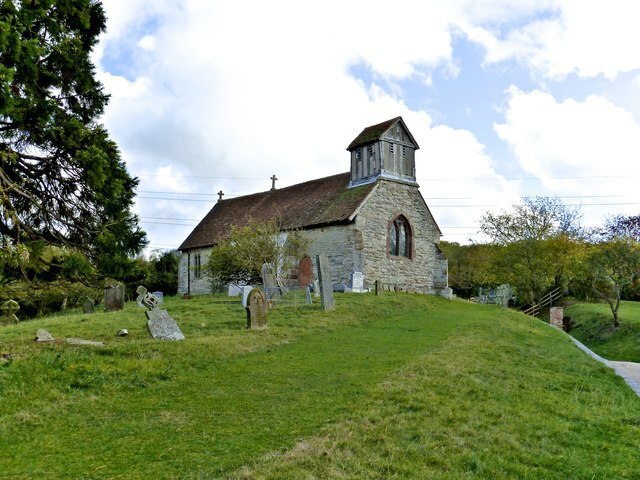 To celebrate the highlights of the Celtic calendar in a special place like the church at Morton Bagot recalls the Celtic idea of “a thin place” – a place where the veil between heaven and earth is thin. I’ve written of this before in my blog post about Sacred Spaces. Many of us can name special places throughout the British Isles which we have felt to be “a thin place.” And this tiny church on the hill is one of them. St Non of Wales presents, in common with many saints, an example of a life which encountered trauma yet overcame. She was an educated woman who chose to devote herself to life as a nun; raped by a prince of the region, she gave birth alone on a clifftop in a raging storm. When the child she bore grew old enough she entrusted him to the church for his upbringing as many did in those days and resumed her life as a nun. Her son grew to become a holy man himself, and we know him as St David. For us today, the example of St Non is one of a woman who suffered, lived through trauma and crisis, and triumphed over a bad situation, coming out the other side, working faithfully with her changed circumstances and then courageously taking up her path again. On the site in Pembrokeshire where Non gave birth, to this day, a pure spring of water flows out from the bedrock where many have come to pray for healing.